When we talk about passion@work we talk about ‘fit’. If we trivialize the importance of dedication, we devalue enthusiasm and energy in the workplace. Suggesting that someone follow their passion is not bad career advice. Yesterday, New York Post journalist Mackenzie Dawson added her voice to the doubters. “But for all its good intent, “Find your passion” can actually be pretty lousy career advice — and it usually doesn’t leave people feeling as though they’re any closer to finding something they really like doing. Her argument is that this advice sets folks up to fail. OK. But how do you learn if you don’t try? And, BTW, most of us embark on passions that are far more manageable than starting the next Facebook. I’m reminded of a conversation I had at a reception a couple of weeks ago with a NYC charter school principal who has found her bliss and whose excitement was downright contagious. This is what finding your passion is about: finding that place@work where you learn, grow and thrive. Ms. Dawson’s article found support in quotes from recruiting firm ReWork co-founder, Nathaniel Koloc. Not sure the charter school principal would agree, and I would offer that her workplace offers both lifelong learning, and adds significant value to the lives she touches daily. A calling, career is not always about the marketplace. No one would offer advice to knowingly set someone up for failure. Success is an evolution built on learning and experience. Passion and value and learning are not mutually exclusive terms. One more thing. Mr. Koloc currently serves as the Director of Talent and Acquisition & Development for ‘Hillary for America’. I always thought that political campaigns were the vortex of commitment and passion @work. Telling someone to pursue their dream is never bad advice. Suggesting they understand the financial implications of their decision is prudent. Doing what you love is priceless. During this week@work three leaders representing the religious, legislative and corporate sectors, demonstrated their leadership strengths and weaknesses on the global stage. Pope Francis on a visit to the United States, challenged national and world leaders to take the lead on major global issues. One of those leaders, John Boehner, internalized the advice and resigned his position as Speaker of the House and Member of Congress the following day. At the same time as the Pope was demanding action on the environment, Martin Winterkorn, the CEO of Volkswagen resigned as his company became the latest example of corporate fraud at the expense of ‘our home’. On Friday, Pope Francis addressed the General Assembly of the United Nations urging world leaders to provide the essential minimum: lodging, labor and land as well as education, religious freedom and civil rights. It was his use of a quote from the poem, ‘El Gaucho Martin Fierro’ which could be easily applied to the competitive atmosphere of corporate life. “El Gaucho Martín Fierro, a classic of literature in my native land, says: “Brothers should stand by each other, because this is the first law; keep a true bond between you always, at every time – because if you fight among yourselves, you’ll be devoured by those outside”. The Pope once again communicated the urgency to protect the environment. “Any harm done to the environment, therefore, is harm done to humanity.” Simultaneously, the global story of Volkswagen violating emission standards by using sophisticated software in diesel models to ‘trick’ environmental testing was made public. “In 2012, a group of researchers at West Virginia University won a $50,000 grant from the International Council on Clean Transportation to do performance testing on clean diesel cars. Arvind Thiruvengadam, a research assistant professor in mechanical and aerospace engineering, told NPR this week that the team was merely excited do the research—which involved driving the clean diesel cars outside the lab—and write a journal paper based on the data. They never expected that they would discover one of the biggest frauds in automotive history. Are you following this? In 2012 – that’s three years ago – academics accidentally discovered one of the biggest frauds in automotive history. And yet, in those three years, the CEO of Volkswagen, Martin Winterkorn maintains he didn’t have a clue. Leading by resignation. Nice try. It’s the culture that defines behavior and that’s set at the top. Whatever the vision Mr. Winterkorn communicated to shareholders, the means to the end derailed the company and the reputation of a respected brand. His accountability ended with an exit. Not the best lesson in corporate governance. On Friday morning, as the Pope was about to address the United Nations, word leaked that the Republican Speaker of the House of Representative, John Boehner was resigning. Here is the perfect example of ‘fighting among yourselves to the advantage of your outside adversaries’. Apparently moderate, constructive, cooperation is not valued in the legislative branch of the U.S. government. When the folks at the extremes have the ability to create distraction and avoid the real work in their job description, is it the role of a leader to step aside to protect the institution? What are the leadership lessons of this week@work? If you follow the lead of Pope Francis and are a bit more humble, listen to your constituency and lead by example you get it. If you are not paying attention, you will end up with a legacy of scandal. In the end, no matter how hard you try to lead, when values disconnect, it’s time to go. These CEOs are almost unanimous in their positive view of economic opportunity, but still struggle with leadership skills. Among the shortcomings: patience, the ability to communicate consistently, and manage well. I think it’s safe to say that we will not be Pope. And most of us will not sit in the C Suite or behind the President during the State of the Union Address. But in our corner of influence, we can demonstrate the traits of a strong leader: humility, empathy, confidence, consistent communication, integrity, and fairness. And bonus points if you are a leader who can employ a quote from 19th century literature to make your point. On Thursday morning Pope Francis addressed the a joint session of the 114th US Congress. He challenged his audience to address issues of immigration, climate change, poverty, family and to abolish the death penalty. Throughout his delivery he demonstrated his quiet but firm leadership style and structured his remarks to reflect American values in the stories of four American careers. ‘The Saturday Read’ this week is the text of Pope Francis’ congressional speech. “My visit takes place at a time when men and women of good will are marking the anniversaries of several great Americans. The complexities of history and the reality of human weakness notwithstanding, these men and women, for all their many differences and limitations, were able by hard work and self-sacrifice — some at the cost of their lives — to build a better future. They shaped fundamental values which will endure forever in the spirit of the American people. A people with this spirit can live through many crises, tensions and conflicts, while always finding the resources to move forward, and to do so with dignity. These men and women offer us a way of seeing and interpreting reality. In honoring their memory, we are inspired, even amid conflicts, and in the here and now of each day, to draw upon our deepest cultural reserves. He included remarks that provided insight to his view of leadership. But, as noted by NPR, the pope omitted a section in the text challenging the influence of money in American politics. “A potentially controversial sentence in the prepared text of Pope Francis’ address went unspoken when he delivered the speech to Congress. The line appears to challenge the dominant role of money in American politics. The text is written to be read. It is a model of how to craft a message: connect with an audience, employ storytelling to illustrate that message, and insure individuality shines through. The ground is shifting the foundations of our world@work. New economic models are emerging of mosaic careers where freelancing is the predominant driver of income. In order to flourish workers will have to reimagine their life@work and add skills previously delivered through full time employers. This is the conversation that should be taking place in corporate boardrooms, university classrooms, state legislatures and presidential debates. Don’t believe me? How did you get to work? Uber? Where did you stay on vacation? Airbnb? The initial repercussions of the new world@work are being felt in the halls of justice as folks try to fit old definitions of work and workers into new, entrepreneurial business models. Sarah Kessler writing for Fast Company summarized the dilemma. James Surowiecki writing in The New Yorker described just how difficult it is to define the difference between an employee and an independent contractor. This is where it begins in the U.S., in the court system. Meanwhile, entrepreneurs will continue to connect clients with products and hire workers who will supplement their income performing a variety of part-time professional services. Eventually the laws will catch up with the workplace reality. But in the interim, universities have to decipher the emerging skill set and prepare the next generation of workers for success. Generativity: How to create something unique, be it a product, a service, or an idea. E.g., coming up with the idea for a widget. Entrepreneurship: How to spot an opportunity and act on it effectively. Discovering a market for widgets. Originality: How to view an existing subject through an unexpected lens. Realizing that the widget can be made more sustainably from recycled water bottles. Interdisciplinary thought: How to bridge concepts from different fields to form new ideas. Combining engineering and design so that the widget is not only functional, but beautiful. The ‘new gig workers’ will also need a basic understanding of business law and finance. Arun Sundararajan writing in The Guardian assesses the micro and macro implications of the new model. Fundamentally, the new ‘gig worker’ will focus on human interaction vs. transactional activities. We are back to the core curriculum of a liberal arts education. The lawyers, politicians and business folk will figure out the structure and protections. The humanists will find job security in the ‘gig economy’. David Brooks writing in The New York Times imagines the new world@work. Gig learning is lifelong learning. We will need leaders in both education and business who will welcome the feedback of their constituencies and be nimble in their response to a world@work that is driven by human interaction in the relational and supported by technology in the transactional. Do business majors have an advantage? Does a particular major give you an advantage in today’s job market? If you were to look to the enrollments in professional school programs around the country you might come to the conclusion that there is a benefit to these ‘vocational’ programs. Do you want to be an accountant or an engineer? Do you need an undergraduate business degree to find a job in business? If you want to be a filmmaker and didn’t get into a film program is your career over? If you’re not planning to be an accountant or an engineer, it really doesn’t matter what you choose as an undergraduate major. What is important is that you choose a major that you enjoy. If you are actively engaged in your studies, you will do well and it will be reflected in your GPA. You should seek out internships that will give you an opportunity to demonstrate the practical application of your education. David Brooks writing in The New York Times imagined an alternative universe to today’s trend to vocationalize higher education. As I write this I know there are many of you who are doubters. But let’s look at your competition. With the exception of the University of Pennsylvania, none of the Ivy League schools have an undergraduate business major. Employers hiring at those schools are looking at traditional liberal arts majors. Check out the bios of the folks who are leaders in your particular field. You may be surprised to see how many theater, philosophy and history majors are leading Fortune 500 organizations. And those filmmakers? How many of them have succeeded because they know how to tell a story and select a score to create the perfect visual image without knowing all the technical aspects of film? The message here is to look at your undergraduate education as a time for intellectual exploration. There are so many career options, even in an economic downturn. It just does not make sense to narrow your choices prematurely. Take electives, get out of your comfort zone. Don’t go for the easy classes, take the ones that challenge you to think and stretch your capabilities. This is what will prepare you for the workplace after graduation. This week@work we learned that future earnings @work is affected by where you attended college. In the workplace, it’s not so easy to make friends@work, ‘ambition’ can be an insult and a networking mindset is about authenticity and generosity. The New York Times contributor Kevin Carey reported on ‘Gaps in Earnings Stand Out in Release of College Data’. Analyzing the data from the federal government’s ‘College Scorecard’ he found not only a disparity in earnings between elite college grads and second tier universities, but also a gender gap in earnings among alumni of those elite colleges. “The data reveals how much money students are borrowing in exchange for earnings after graduation. While U.C.L.A. and Penn State are both prestigious public research universities, recent U.C.L.A. grads leave with about 30 percent less debt, even as their predecessors are earning about 30 percent more money than counterparts at Penn State. Harvard students borrow barely a quarter of what Brandeis students take on, and earn nearly twice as much. Let’s imagine you have landed a great job, what are your expectations of the workplace? Do you want to socialize with colleagues? “Once, work was a major source of friendships. We took our families to company picnics and invited our colleagues over for dinner. Now, work is a more transactional place. We go to the office to be efficient, not to form bonds. We have plenty of productive conversations but fewer meaningful relationships. It’s not that Americans are less concerned with relationships overall. We’re social creatures outside work, yet the office interaction norm tends to be polite but impersonal. Some people think pleasantries have no place in professional meetings. Why are Americans so determined to get down to business? The economic explanation is that long-term employment has essentially vanished: Instead of spending our careers at one organization, we expect to jump ship every few years. Since we don’t plan to stick around, we don’t invest in the same way. We view co-workers as transitory ties, greeting them with arms-length civility while reserving real camaraderie for outside work. If you don’t build relationships @work, how will you navigate the corporate culture? How will you understand how to motivate a diverse workforce? How will you learn that the word ‘ambition’ is one of those code words with different meaning for men and women? Kristin van Ogtrop, editor of Real Simple magazine reported on the results of a poll conducted by Real Simple and Time magazine exploring how men and women define success and ambition. The key to building and sustaining relationships in the workplace is networking. Our attempts to reach out may fail and it may be because we are a bit too focused on our side of the equation. CEO and co-founder of Alumnify, AJ Agrawal shared his thoughts on ‘How to Develop a Networking Mindset’. “Over and over again, we hear about the importance of having connections to get ahead in business and in life. “It’s not what you know, it’s who know” as the famous saying goes. While people repeat this all the time, it questions the meaning behind relationships. Do we make connections because we like the person’s work and ideals, or because we think they can help us? Did you want to be an astronaut when you grew up? Maybe you thought about signing up for the one way ticket to inhabit Mars? The ‘Saturday Read’ this week, ‘The Martian’ by Andy Weir, is another ‘suggested read before you see the movie‘. The novel was described by Joel Achenbach in the Washington Post as the book that may have saved NASA and the entire space program. There are two career narratives here. The first is the author’s story and the path to publication. The second is the fictional story of Mark Watney, his fellow astronauts and the folks at Mission Control. On the first page we are introduced to astronaut Watney, on Mars. Our narrator is a member of the third crew NASA sent to Mars. “Ares 3. Well, that was my mission. Okay, not mine per se. Commander Lewis was in charge. I was just one of her crew. I would only be ‘in command’ of the mission if I were the only remaining person. Have you ever taken part in one of those team building sessions where you are lost at sea with only ten salvaged items? You have to rank order them and imagine how each will improve your chances for survival. 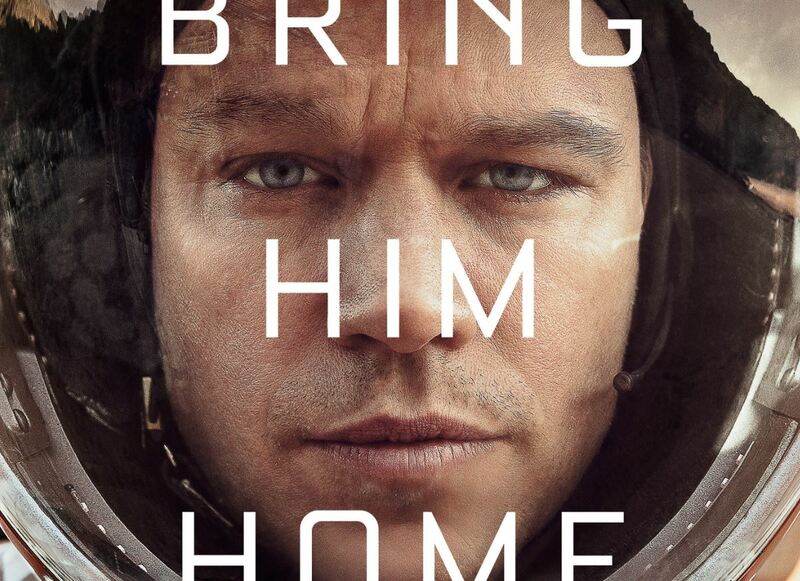 ‘The Martian’ is a natural for a new version of imaginary survival training. I should mention that these are excerpts from Watney’s log of his time on Mars. For the major portion of the book we follow him as he connects an amazing array of dots to stay alive. This is a book about problem solving and this astronaut makes MacGyver look like an amateur. For the first 50 pages we are alone with our inventive astronaut as he creates a habitat on an uninhabitable environment. Not so fast…enter Mindy Park at SatCon, NASA. Mindy finds signs of life in satellite images and soon the world knows Mark Watney has survived. Here’s the problem. He has to endure 1,412 more days before any possible rescue. This is also a book about leadership, taking risks, personal sacrifice and exhausting all possible resources to accomplish a goal. It has all the elements of a Harvard business case study, but with a sense of humor. The ‘other’ career story, of author Andy Weir, was reported by Kelly Dickerson for Business Insider. “His earlier attempts at writing pretty much flopped, but “The Martian” took off, partly because it captures Weir’s enthusiasm for science and space exploration. That’s when the floodgates opened. More people downloaded the 99-cent Amazon version than had ever downloaded the free version, Weir said, and readers started leaving positive reviews on Amazon. In just a few months it skyrocketed to the top of Amazon’s best-selling science fiction list. 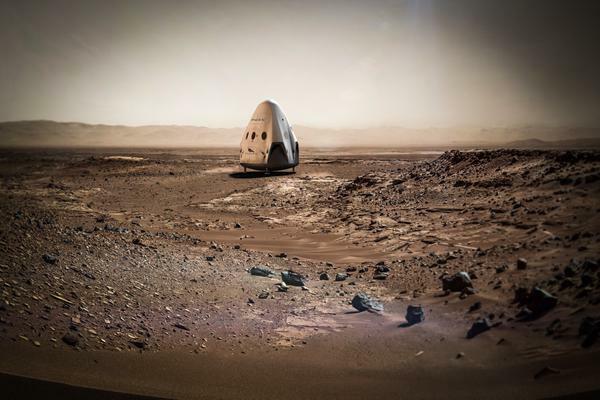 And in case you thought it was just a novel or a movie… Entrepreneur Elon Musk posted a photo on Twitter this week of his Dragon Spacecraft landing on the red planet. Enjoy the ‘Saturday Read’ – ‘The Martian’. Not all of us have the opportunity to interview candidates in our workplace, but when we do, we want to get it right. We want pose the question that elicits a response providing a hint to how this individual will perform if selected. Tonight, in California, the candidates seeking the Republican nomination for president will participate in a debate. In reality, they will be answering interview questions posed by journalists. What question would you ask? If you don’t know where to begin, Adam Bryant’s weekly executive interviews column in The New York Times is a good place to start. In an interview last month, Greg Schott of software company, MuleSoft shared his hiring philosophy. “First off, we’re looking for someone who’s a good human. That is defined by high integrity, being a great team player, and they want to win as a company first, team second, individually third. The next thing we look for is people who are whip-smart. The third thing we look for is a clear track record of achievement. We definitely want someone who’s a good human to be president. I would like to know why they left their current job to take the next one. Why have some not left their current job yet? What have they done above and beyond the job description? Integrity, smarts, record of achievement all good. Maybe I’d add a question about flexibility, dealing with ambiguity. Describe a belief you held for a long time that with some education and experience you changed? Being president requires leading the folks you don’t agree with along with those who voted for you. Starbucks CEO Howard Schultz shared his opinion on the election process and the responsibility of those elected to represent us to act differently, and posed his questions for the candidates. “Every one of the candidates offers grand promises about new leadership and new solutions. But where do they stand on working with their rivals? Regardless of who wins the presidency, the odds of the same party controlling a filibuster-proof Senate are slim. If we want to turn the nation around, we have to act differently. Save for the most rabid partisans, most people don’t want one-party rule. They want Democrats and Republicans to work together. Stewart Butterfield of communications service company Slack discussed his interview process with Adam Bryant. “I used to always ask three short questions — one math, one geography and one history. I didn’t expect people to get the answers right, but I just want them to be curious about the world. The first is what’s three times seventeen. Then name three countries in Africa. You’d be astonished by the number of people who can’t do that. And what century was the French Revolution in, give or take 200 years. This is what I want to know. What did these folks on the stage at the Reagan Library want to be when they grew up? Ok, they wanted to be president. But it’s not enough to want. What do they still wish to learn, to accomplish? What does their world look like at the end of a successful presidency? The answers will give me the information I need to make a decision. And, I would like them to name three countries in Africa.